4 Broadcaster Press 1815 Miscellaneous Seniors & Disabled GET HELP NOW! One Button Medical Alert. We will be there when falls, fires & emergencies happen. 24/7 Protection. Low Monthly Cost with Free Shipping and Free Activation. Call 1-844-646-5592 Today for more information. (MCN) Are Large Noisy Beetles Causing Garden Problems? October 9, 2018 www.broadcasteronline.com A Desk Full of Memories By Daris Howard As we moved furniture recently, a small white desk brought a flood of memories to my mind. My wife, Donna, and I had only been married about a year and a half and had a two-month-old daughter. I was struggling to work my way Spectrum Triple Play! TV, Inthrough college and take care of my little family. What work ternet & Voice for $29.99 ea. I found was usually part-time, paid minimum wage, and was 60 MB per second speed No seldom steady. contract or commitment. More Donna tried to save money in every way she could. She Channels. Faster Internet. Unlimited Voice. Call 1-855-577purchased an old sewing machine at a garage sale and sewed 7502 (MCN) our clothes. Much of the work I found was hard, physical work, and I often tore holes in my clothes, especially my STEEL CULVERTS FOR pants. Donna patched them until even my patches had patchSALE: New, All sizes. 605-661es on them. 5050 or 605-387-5660. Ulmer Farm Service, Menno, SD. But it was hard for me knowing Donna had no desk at which to sew. The only surface we had in our apartment was Want to purchase minerals the small kitchen table. But it was hard to lay everything on and other oil/gas interests. it, only to move it to eat. And it didn’t fit much more than Send details to: P.O. Box the sewing machine. I would come home from a long day of 13557, Denver CO 80201 (MCN) work, and Donna would be sitting on the floor sewing, with the baby close by. It was cute, but it was hard on Donna’s 1820 Give Aways back and made her tired. I decided to try to get her a sewing desk. Everywhere I went I looked for an inexpensive desk at Free dry firewood, you cut. 8 miles south of Yankton. 402secondhand stores and every garage sales but found nothing 360-2808. we could afford. Then, one night, we went to a charity auction. I scraped Free kittens. Black and white, together every penny we had and counted twenty dollars. I 8 weeks, wormed, gentle, litter was hoping to buy some tools to fix our small pickup. It was trained. Tyndall . Call 605-7602204. our only transportation, and it was not running well. At the auction, we added the Jello salad that Donna made with the 1870 Ag Equipment other potluck food and then paid the five dollar donation for the meal. After we ate, we wandered among the donated 1998 Case IH 2366 Combine, 1,988 sep. hours. Very good items before the auction started. condition, Call 402-373-2696. I found an old set of tools that I thought would work for what I needed. They had a suggested starting bid of five dol1885 Equipment Repair lars. But then something else caught my attention. I saw Donna standing by a nice little desk. It wasn’t just any desk; it was DIESEL FUEL INJECTION SERVICE a sewing desk with drawers made for bobbins and other useCentral Fuel Injection Service ful items. I saw her look at the suggested bid and disappointCo has diesel fuel injection By First Lady Linda Daugaard to children in need of affection and direction. edly turn away. I went over and looked at the tag. It suggested pumps, injectors, and turbos in In any given month over the last year As a former teacher and librarian, and a thirty dollar opening bid. My heart sank. The desk would be stock ready for exchange, or there were around 1,600 children across as a mother and grandmother, I know how we can repair your own unit. perfect, but we only had fifteen dollars left. important it is for children to have uncondiContact us at 2403 Murray Rd South Dakota in state custody. These are The auctioneer started and moved through the items Estherville IA 51334. Call children who have been removed from their tional love as well as limits. That is why in quickly. When he got to the tools and started the bid at ten 712-362-4200, 800-548-9464, homes by a court order for safety reasons. 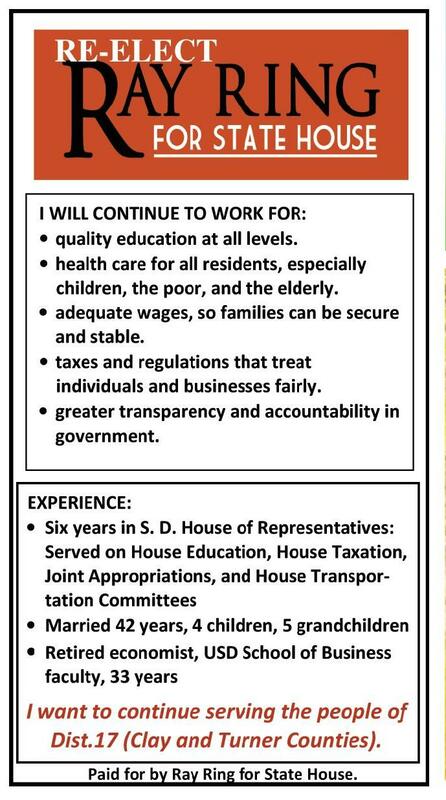 2013 I worked with the Department of Social dollars, I almost bid. But somehow, I couldn’t do it. All I could service@centralfuel.com They are victims of abuse and neglect who, Services to launch the FosterOne program www.centralfuelinjectionserthink of was the desk. The tools sold for twelve dollars, and by no fault of their own, have no other place by which we encourage South Dakotans vice.com Donna asked why I didn’t bid. to go. to commit to know more about becoming Facebook: “I’m not sure they were what I needed,” I replied. Central Fuel Injection Service These children are in need of a loving a foster parent. Since the initiation of that That was true, but there was a more important reason. Co. home. Like any child, they need uncondition- program, we have had 2,128 families sign up When the desk came up for bid, the auctioneer asked, “Who al love, guidance and support. That’s where to learn more and we’ve seen an increase will bid forty dollars?” No one said anything, so he dropped it foster families come in. in foster homes, including American Indian to thirty-five, then thirty, then twenty-five. Still no one bid, so Foster parents make a difference in the foster families. he moved to something else. lives of children and their birth families. In This is encouraging, but the need for When he had sold almost everything else and paused for many instances, they provide healing by more volunteers still exists. There is a a moment, I slipped up to him. offering a safe and stable environment until particular need for foster parents who can “Are you going to sell the desk?” I asked. a child can return home. In some situations, take sibling groups, American Indian foster “No one seemed to want to start the bidding,” he replied. they become the permanent guardians parents and families who are willing to care “I would have, but I don’t have as much as you wanted,” I themselves through the adoption process. for teenagers. Foster parents must be 21 said. “But I would like it for my wife.” Whether it’s years old, trained and licensed, and can be “How much do you want to bid?” he asked. a short- or related or unrelated to the child. “Fifteen dollars is all I have,” I replied, “and I will bid it all.” long-term We need more South Dakotans who are He looked at me and seemed to realize that I was a strugplacement, willing to provide this selfless, life-changing gling college student, and he smiled. “You’ve got yourself a foster famicare. Please consider opening your heart and desk.” lies provide your home to help a child in need. You can He motioned to the lady marking down the sold items, selfless care commit to know more at fosteronesd.org and she handed me the paper to pay for the desk. But after THE CITY OF VERMILLION everything else was sold, a man asked about it. The auctioneer told the man the desk was sold. IS SOLICITING QUOTES. “But no one even bid on it,” the man complained. 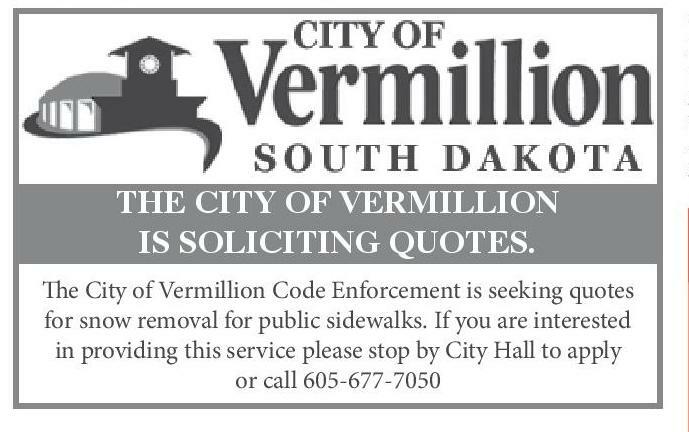 “I The City Vermillion Code Enforcement is seeking quotes The City ofof Vermillion Code Enforcement is seeking planned to, but I didn’t want to start.” quotes for snow removal for public sidewalks. Earn as much as $400+ this month for snow removal for public sidewalks. If you are interested The auctioneer turned and smiled at me, then said to the in providing this service please stop by City Hall to apply If you are interested in providing this service please stop & $120 this week man, “I doubt you could have beat the bid, because you’d or call Hall to apply. 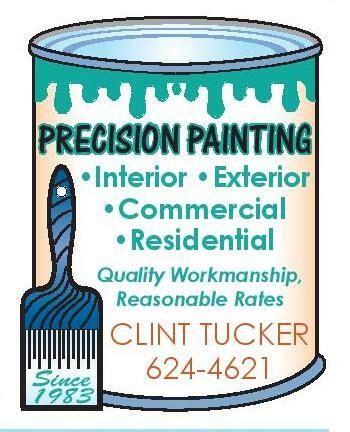 by City 605-677-7050 have to give everything you had.” And as we recently moved the old desk, I think PRECISION PAINTING Donna remembered, attoo, because she looked it, FARMLAND FOR LEASE •Interior •Exterior smiled, and hugged me. 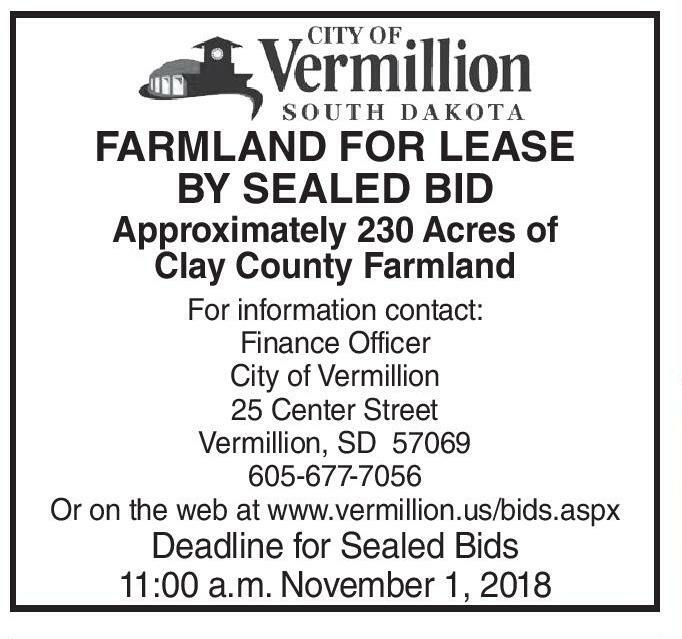 •Commercial BY SEALED BID •Residential Approximately 230 Acres of BROOKINGS, S.D. - If you've seen a large noisy beetle resembling a June beetle in your yard or garden this fall, you're not alone. Adam Varenhorst, Assistant Professor & SDSU Extension Field Crop Entomologist said the SDSU Extension team has been receiving reports of the bumble flower beetle. "They show up later in the season and feed on ripe garden produce," Varenhorst explained. Although the bumble flower beetle and June beetle are related, Varenhorst said there are quite a few characteristics that can be used to tell them apart. "One of the biggest differences is the timing of their arrival," he said. "June beetles are most frequently observed from May to June, while the bumble flower beetle appears from late July until the first hard frost." Another distinguishing characteristic of the bumble flower beetle is its light to dark brown body color with black and light mottling patterns (Figure 1). Bumble flower beetles are also mostly covered in dense, light-colored hairs, and make a very noticeable buzzing sound while flying (Figure 2). Not a pest to worry about Although these beetles often get blamed for damage to tomatoes and apples, Varenhorst says the criticism isn't fair because they are only feeding on produce that was already damaged. "The bumble flower beetles are attracted to sweet or fermenting liquids and ripening crops," he said. "Bumble flower beetles are not considered a major pest, and the best way to manage them is to remove them from infested areas and destroy them." In addition, routine picking and removing of damaged produce from the garden can reduce the presence of bumble flower beetles. For apple trees, Varenhorst encouraged the removal of any blemished apples and ground falls from around the base of the tree. 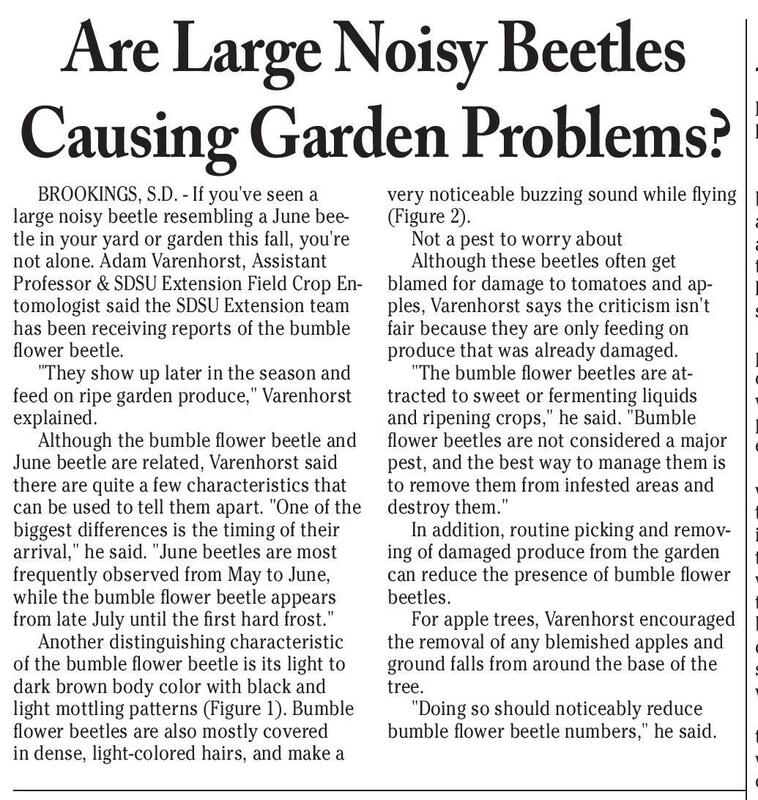 "Doing so should noticeably reduce bumble flower beetle numbers," he said. 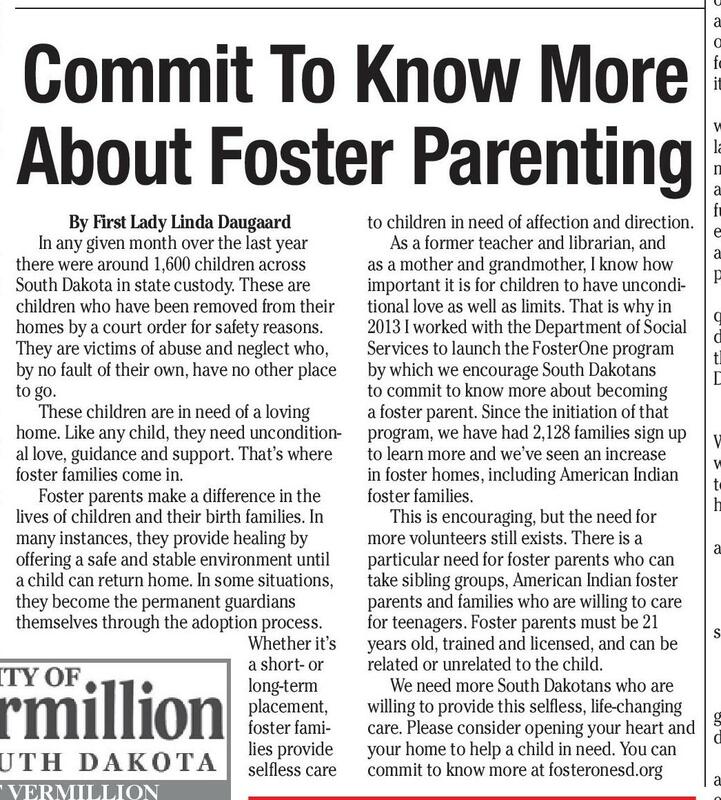 Commit To Know More About Foster Parenting Quality Workmanship, Reasonable Rates Clay County Farmland For information contact: Finance Officer City of Vermillion 25 Center Street Vermillion, SD 57069 605-677-7056 Or on the web at www.vermillion.us/bids.aspx Deadline for Sealed Bids 11:00 a.m. November 1, 2018 Since 1983 CLINT TUCKER 624-4621 BUILD A THON & BBQ PARTY Habitat For Humanity Clay & Yankton Counties Thursday, October 11th • 5pm – 8pm Austin Elementary 300 High Street, Vermillion Habitat’s family friendly event includes live music, fun kid activities, delicious food and live/silent auction items. 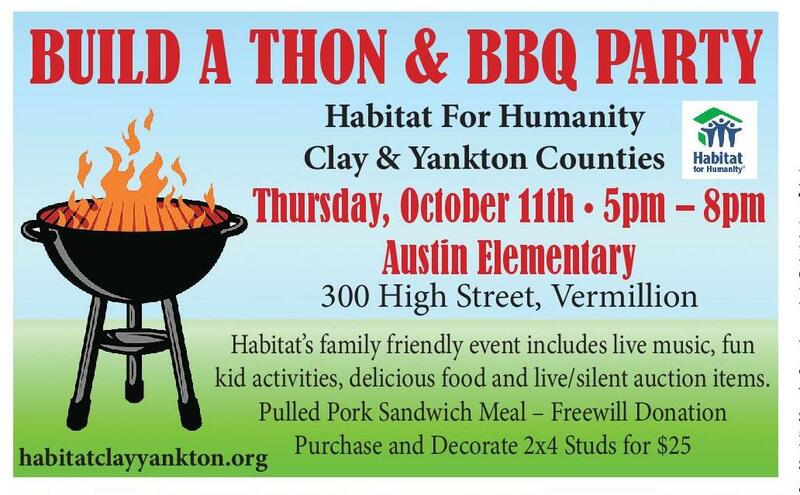 Pulled Pork Sandwich Meal – Freewill Donation habitatclayyankton.org Purchase and Decorate 2x4 Studs for $25 FREE Brats, Burgers, Chips, Pop & Cookies Register For Prizes! Grand Prize Electric Grill! 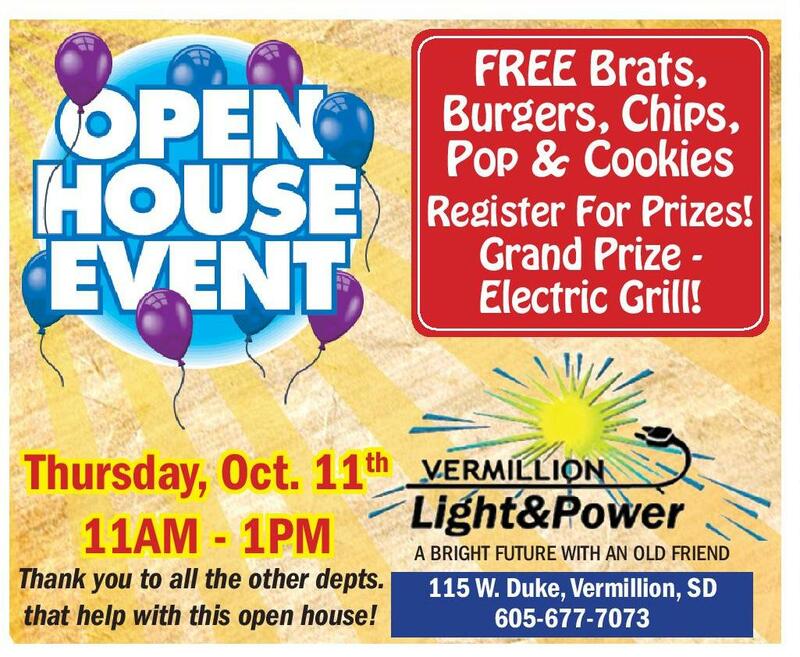 Thursday, Oct. 11th 11AM - 1PM Thank you to all the other depts. that help with this open house! A BRIGHT FUTURE WITH AN OLD FRIEND 115 W. Duke, Vermillion, SD 605-677-7073 Election Signs Not Allowed In Right Of Way PIERRE, S.D –The South Dakota Department of Transportation reminds the public that political campaign and ballot-issue signs cannot be placed on state highway rights of way. “With election season upon us, election signs are showing up along the state’s roadways,” says Kristi Sandal, public information officer. “Illegal signs create a safety hazard and may distract motorists from seeing important regulatory or directional signing.” The use of right of way is reserved for official highway signage. All signs in the right of way that are not required for traffic control, as authorized by law (SDCL 31-28-14), are prohibited and will be removed by SDDOT crews as they see them or as they are reported. Attempts to contact the owner of the signs to pick them up will be made. Municipal ordinances regulating placement and removal of campaign signs within towns and cities do not have precedence over state jurisdiction and supervision of state highway rights of way within municipalities.